Everyone feels better after a nice long walk—including your dog. Fresh air, exercise, and just getting out of the house is always refreshing. However, pet parents can’t always be there to walk their pups throughout the day. That’s where Camp Bow Wow Cedar Rapids comes into the picture. 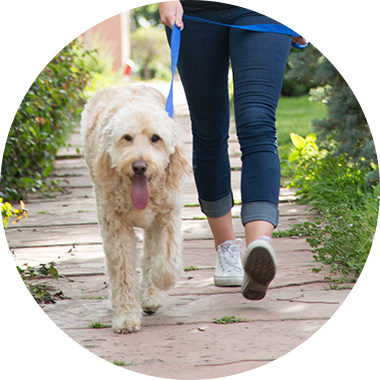 Our Certified Caregivers will come to your home, greet your pup with a smile, and take them on a walk to ensure they get the exercise they need and love. We can help you satisfy your dog’s needs without interrupting your busy schedule, so you can come home and relax with your happy, pooped pooch. When finding a babysitter or a day care for a child, parents diligently research and explore their many options. Safety and security are the number-one requirements of any service that is going to take care of your family. Dog walking and pet sitting services should be held to the same standards. Camp Bow Wow Cedar Rapids ensures that your dog will always be in safe, trustworthy, and reliable hands—and all while having fun. All our Caregivers are certified to perform pet first aid and CPR for additional peace of mind. Who let the dogs out? We did! Contact us today at (319) 393-3647. Dog Walking Services Call for pricing!